The Lions won three of their first 25 quarters in 2015. They have now won six including their last three. The Lions have won five clearances in their forward 50 and scored 3.2 (20) from them. The Lions have won 22 clearances in their forward half and scored 5.2 (32) from them. Daniel Rich has won a teamhigh nine clearances despite playing forward. His career high is 12. 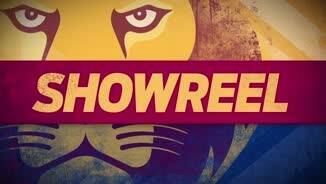 Brisbane Lions InterchangeMitch Golby was substituted into the game for Tom Cutler. 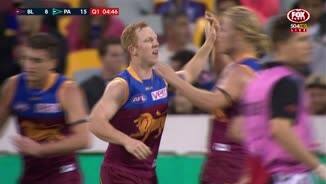 Brisbane Lions InterchangeMitch Golby was substituted into the game for Nick Robertson. The Power have gone inside their forward 50 eight times from 31 chains originating in their defensive 50 and scored 1.3 (9) from them. Mitch Robinson jumps thirdman up to launch the Lions' eighth goal from stoppages. 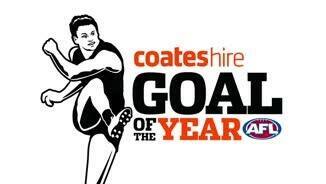 The Power's scoring accuracy is 31.6 per cent. Prior to this game the their scoring accuracy in 2015 was 64.4 per cent. The Power lead marks in forward 50 96 but have been outscored 1.4 (10) to 5.1 (31) from marks. Dayne Beams has had 15 disposals this quarter. No other player has had more than seven. 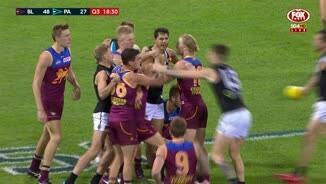 Port Adelaide InterchangeKarl Amon was substituted into the game for Matt White. 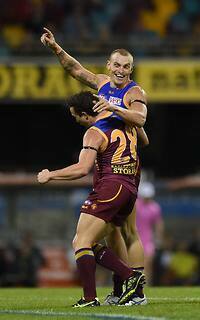 Dayne Beams has won six clearances with three of them launching Lions' goals. Dayne Beams has had a gamehigh nine disposals this quarter and leads all players with 179 metres gained. 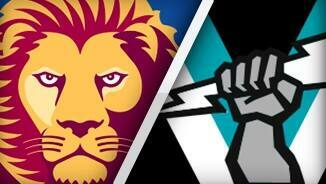 The Power lead clearances 76 this quarter and have scored two goals to one from stoppages. Welcome to Gabba for the Brisbane Lions v Port Adelaide Round 7 clash. 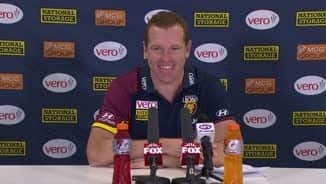 THE BRISBANE Lions have backed up last week's breakthrough win over Carlton with a stunning 37-point victory over Port Adelaide. After a low-scoring start to the game, the Lions booted six goals in the second term to set up the impressive 15.12 (102) to 8.17 (65) triumph. The win sees the Lions move off the bottom of the ladder, while questions will be asked of Port Adelaide's premiership aspirations after they slumped to their fourth loss of the season. Power coach Ken Hinkley was not hiding from his team's worrying form, saying there would be some soul-searching ahead of next weekend's match against rejuvenated Richmond. "It was disappointing," Hinkley said. "We were beaten by a better team and that's ok, but we didn't deliver on what fundamentally you have to deliver on in a game in the football, and that's being prepared to be in the contest. "I think it's certainly a lack of work-rate and a willingness to compete for the four quarters. We can hide from it, but tonight there's nowhere to hide. 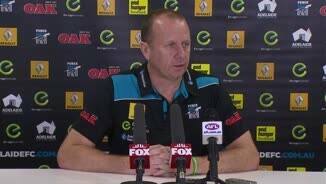 "We're not prepared to do enough hard work and that won't cut it at AFL football." Dayne Beams (32 disposals and one goal) and Daniel Rich (23 and nine clearances) led the way for the Lions, who were assisted by Port's wastefulness in front of goal. Travis Boak (27) and Robbie Gray (25 and one goal) toiled hard for the Power, while veteran Kane Cornes had 13 disposals and kicked one goal in his penultimate match before retirement. Lions coach Justin Leppitsch said it was the best win of his short tenure at the club. "We didn't win all the KPIs on the day, but if you play your role, you always give yourself a good chance to win," Leppitsch said. "I always felt he players bought in to what we were doing. It was just the execution (that had been the problem). "We've got a bit of confidence in the execution now and that's what last week did and this week reinforces again." 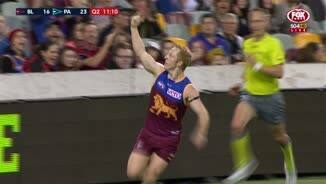 Leading by 21 points at the main break, the Lions extended their advantage four minutes into the second half when Jed Adcock booted a great goal from beyond the 50. Two majors to Angus Monfries had Port back in the contest until Brisbane kicked three of the next four goals to lead by 25 points at three-quarter time. The visitors had two golden opportunities to narrow the deficit through Monfries and Paddy Ryder in the early stages of the final quarter but were punished for their profligacy when ex-Blue Mitch Robinson kicked his third goal, three minutes into the term. Chad Wingard rekindled Port's hopes when he booted his first major of the match after three prior misses, however goals to Rich, Ryan Lester and Lewis Taylor took the Lions' advantage beyond seven goals inside the final 10 minutes.